Tender roasted cauliflower in an aged white cheddar sauce that is baked until golden brown and bubbling with a crispy panko breadcrumb topping. The roasted cauliflower and aged white cheddar soup has been on my mind a lot lately and when it came time to think about side dishes for my Thanksgiving dinner one of the first ideas that came to mind was to convert the soup into a side dish. It seemed only natural that the side dish would take the form of a gratin and a roasted cauliflower and aged white cheddar gratin was sounding really good! Although steamed cauliflower would work in a gratin, I wanted the extra flavour that roasting adds even if it meant more oven time! I kept the gratin really simple with a base of an easy bechamel sauce that the aged white cheddar is melted into before being poured over the roasted cauliflower. Once the cauliflower has been roasted the aged white cheddar bechamel sauce has been made, all that need to be done it to mix them, top them with panko bread crumbs and then bake them until golden brown. Tip: Make sure to brown the butter and then cook the flour in the butter until it starts to brown to get more flavour in the bechamel sauce and ensure that there is no flour-y taste. Bacon: Smoky bacon or even pancetta would be a great addition and for the daring, replacing the butter in the bechamel sauce with bacon grease would add even more smoky, bacon-y goodness! 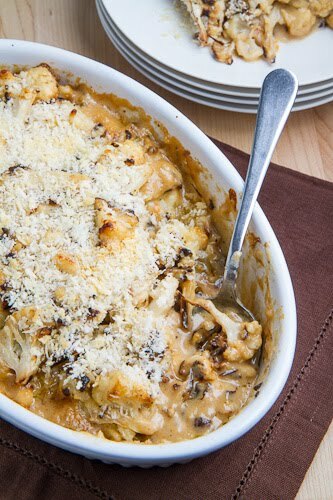 Mushrooms: Sautéed mushrooms or dried porcini mushrooms would also be amazing in this gratin! Bacon and Mushroom: Combine all three to make something even more decadently delicious! Melt the butter in a saucepan over medium heat, mix in the flour and let cook until it just starts to brown a little. Mix in the milk, nutmeg, salt and pepper and cheese and heat until the cheese melts and the sauce thickens. 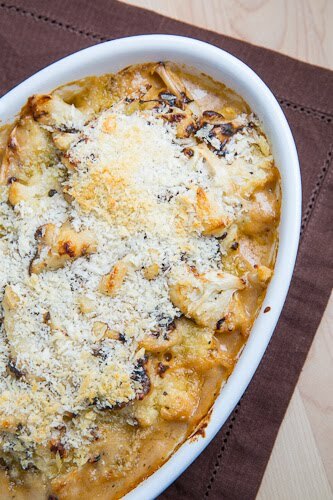 Mix cauliflower into the bechamel sauce, pour into a baking dish and top with the bread crumbs. Bake in a preheated 350F/180C oven until it is bubbling on the sides and golden brown on top, about 15-20 minutes. The soup is FANTASTIC!!! I have made it three times in the past two weeks. This looks amazing as well. I will have to make it this weekend. Wow! This looks sooooo good! Thanks for sharing! This sounds unreal! Love the aged cheddar!! this looks beautiful…perfect fall recipe. This dish looks incredible! I go crazy for all things cauliflower and this looks like the perfect combination of flavors! This looks tremendous and is probably a great way to serve up large amounts of cauliflower! This looks so good. What do you think about adding mushrooms? This looks heavenly….super combination….cheddar would add the perfect flavoring to the cauliflower!! You definitely chose the perfect cheesy creamy side dish! Dude. This is so killing me good right now. Anonymous: Mushrooms would make a wonderful addition! I was thinking about either adding sautéed mushrooms or dried porcini mushrooms but one of my guests did not like mushrooms so I went without. Oh, Kevin, you always post the most delicious looking and sounding recipes on the internet! Oh Kevin… this one seriously has me drooling. Amazing! What a delicious cauliflower recipe! That combination sounds heavenly! And with mushrooms and bacon, yes please! This looks lovely, a good twist on cauliflower cheese. I've never had roasted cauliflower before, it could be time to try it! This has been bookmarked! My husband isn't a fan of cauliflower, but maybe this could change his mind. How could anything with aged white cheddar not be good? And it's beautiful, too! Made the cauliflower casserole. It was awesome! Gorgeous! I have a very similar roasted cauliflower gratin recipe, I also top mine with panko. Sometimes I add a touch of cayenne for heat. It's one of my favorite comfort foods. made this and added mushrooms and bits. also topped it with more shredded aged white cheddar. it was awesome! thanks so much for sharing! I may have found my first Thanksgiving side! Analee: The mushrooms would be an excellent addition! I am glad that you enjoyed it! This is absolutely amazing! Made it the first time in mid-October and it was so yummy, I knew I would be making it again for Thanksgiving. I made a larger batch, since I was serving ten people and I'm certainly glad I did…because it disappeared. Almost everyone said it was their favorite side! I added leftover ham and called it dinner. Delicious. Thanks! I made the soup last night and we loved it! Can't wait to try the gratin. This recipe looks great! I love cauliflower with cheese, but this recipe takes it over the top…love it! Staci: Yes, skim milk will work! I am glad that you enjoyed the soup! Can I make this in advance? I'd like to make it Tuesday or Wednesday (prefer Tuesday) to serve Thursday — but will it get too mushy? Anonymous: I have not tried making it a day ahead. It might be best to roast the cauliflower and make the sauce and then just assemble and bake on Thursday. I'm obsessed with roasted cauliflower lately and this just looks great! I featured it in a recent cauliflower recipe round-up on my blog, thanks!